Indie book award longlist announced! And look here! Room On Our Rock is in fine company at the Indie Book Awards. We are thrilled to see our back-to-front book about refugees receive recognition from the independent booksellers. German edition of Room on Our Rock! How delightful is this! The German cover of Room on Our Rock is in! Published by Annett Betz, we love how the publisher has used a silver letter K to change the title from meaning ‘No Place For Us’ to ‘A Place For Us’. It’s very clever and very special. This is only the first international cover we have seen yet. There are so many to come! We’re looking forward to seeing the US, Hungarian, Brazilian, Malaysian, Russian, Turkish and Japanese version come in soon! We’ve just completed our last school visit for a while and hung up the dancing shoes! 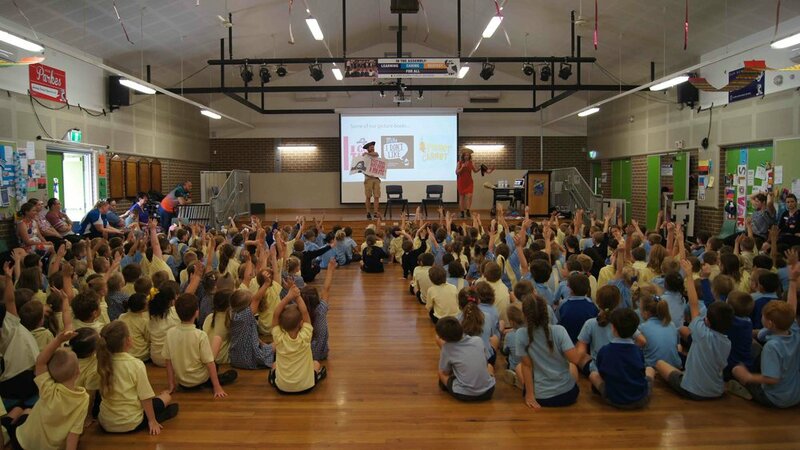 All up our school travels took us to seven cities, three writers festivals and saw us do 82 individual sessions. It sounds like a lot, and perhaps for writers like us accustomed to sitting in quiet rooms thinking stuff up, it is, but still, we love it. We’ve talked books and ideas with thousands of brilliant children. We’ve been bowled over by the most incredible librarians and teachers who do a tremendous job of making literacy exciting and accessible. We also came out of it with millions of new ideas and can’t wait to start writing them down. If you’d like us to come to your school, drop us a line. You might remember Alice Toolie from our Captain Jimmy Cook books? Who could forget! As Jimmy's nemesis she was forever driving him nuts. Well BAD NEWS Jimmy, Alice is your new pen pal. This book is a collection of letters between these two larger than life characters. It's full of unicorn slime, jellyfish costumes and a toilet ghost that causes some serious damage. It’s also nice to see a really funny girl getting some time in the sun. Have you noticed it’s mostly boys that are the main characters of funny books. Not this time… Time to shine! At Katejoltemple.com we're not afraid of a little trumpet blowing. TOOT! So when we got the offer to step into the booth at ABC Radio National and talk about Room On Our Rock with the sparkly Hamish Macdonald – that was a yes. And what fun we had! As it was Refugee Week, it came at a great time, giving us the chance to talk about the role fiction has to play in helping build empathy on big social issues. It's not often that children's literature gets national exposure and we're very grateful to have an ABC that makes it possible. NEW BOOK! ARE YOU MY BOTTOM? Inspired by the PD Eastman classic, ARE YOU MY MOTHER, this is a very literary take on the genre of bottom books. It's got Pandas. It's got bottoms. It's got pictures by Ronojoy Ghosh. It's got an ending so sweet and unexpected it will have you smiling for days. What more do you need? Nothing. It's out July 1. Yay! 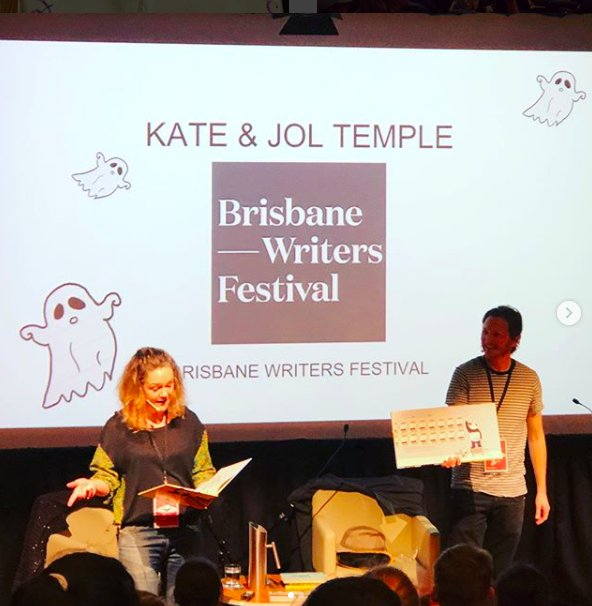 Well hello there Sydney Writers' Festival. Don't you look all fancy and dressed up? YES! Yes you do... and so do we! And why not? There's books to read. Authors to meet and fun to be had. Slimy sponge shoes. Exploding cactus noodles. 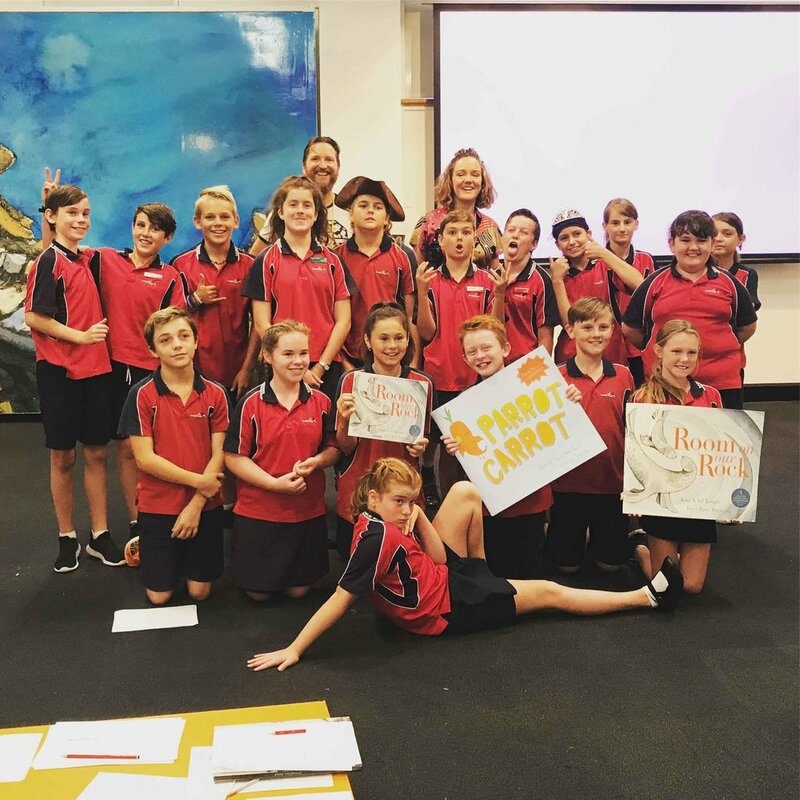 Penguin scented shinny spray – just some of the marvellous things the grade 5/6s came up with in our persuasive writing workshop! We meet thousands of kids, no MILLIONS, no BILLIONS of kids from in and around Newcastle and particularly enjoyed getting out to some regional hotspots like Kurri Kurri where the kids are awesome and chicken salad is too. 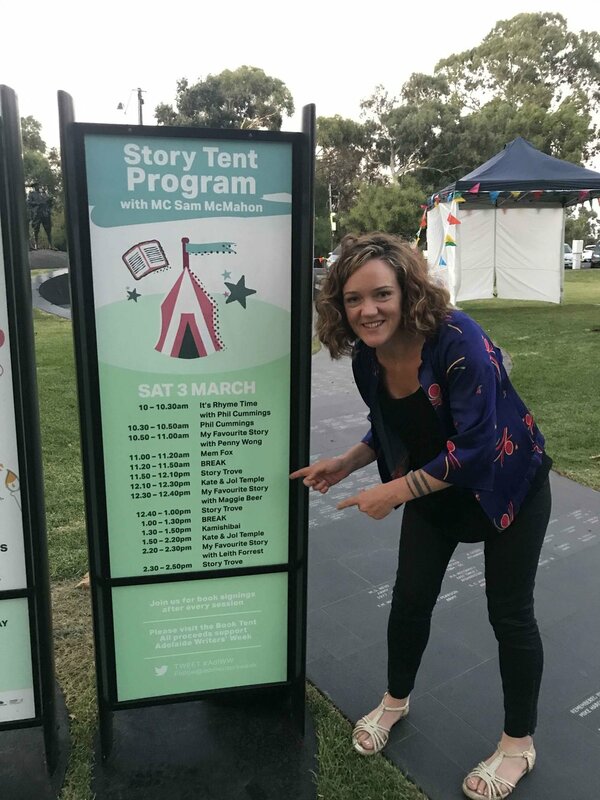 Adelaide Writers' Festival – Kids' Weekend! And here they are! The snapshots. The highlights. The good times. All from the Adelaide Writers' Festival Kids' Weekend. There were big pictures books and big hats. We read our new book Room On Our Rock and it was pretty great to see that so many people are enjoying this story of empathy. No one ever said, "Gee, we've got way too much empathy." So let's go bananas and help ourselves to a little more. Thanks Adelaide for having us. Jimmy Cook makes the 2018 CBCA Noteables! You can't keep a good captain down! Captain Jimmy Cook X Marks the Spot has dug his way out of trouble only to find himself sitting pretty on the Children's Book Council of Australia Notable list for 2018. Gold Star Jimmy! 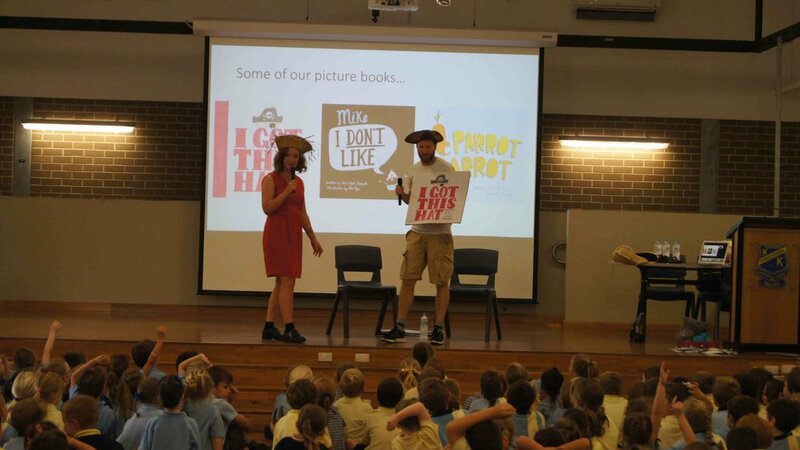 We were lucky enough to have the CBCA award Captain Jimmy Cook Discovers Third Grade Honour Book at last year's book awards and it was nothing short of terrific. There are many of our favourite authors and illustrators on this years list with wonderful books. Some of them we'd read already and others are now on our reading list. Well done everyone! Captain Jimmy Cook Discovers Television! This is exactly the kind of thing Jimmy would like.... A TV show about him! This is the bunch of talented folk we spent two days with, coming up with ideas for a Jimmy show. It was hosted by the Australian Children's Television Foundation and Pirate Size Productions and nothing short of a ball. This is the cover of our brand new book ROOM ON OUR ROCK. It's a pretty special thing. It's a book about sharing that can be read front-to-back or back-to-front for a very different perspective on the same story. We’re hearing from schools, teacher/librarians and parents that little kids are enjoying this book as a story about empathy and thinking about others where as older readers are making connections to social issues. It's very exciting to see the book resonating with so many different age groups. 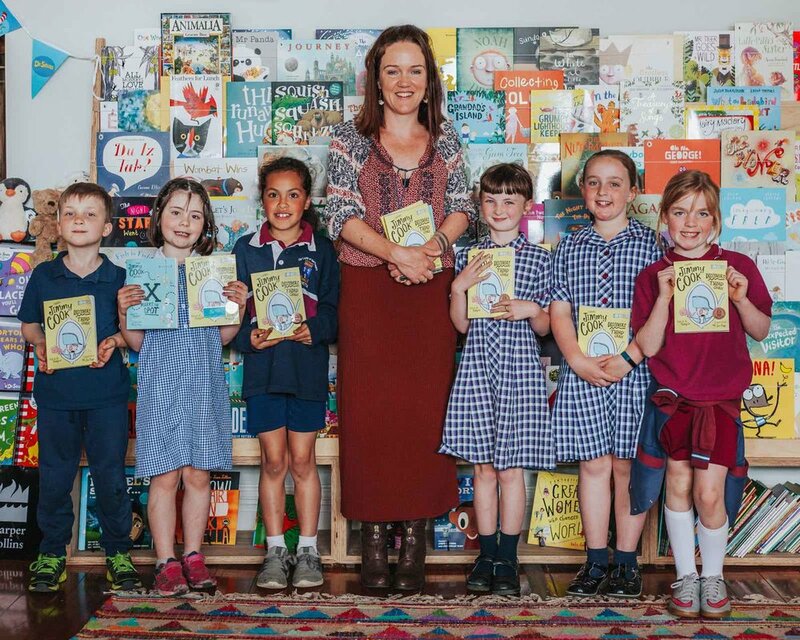 We, along with the talented NZ artist Terri Rose-Baynton and publisher Scholastic, are donating $1 from the sale of each book towards Australian Literacy and Numeracy Foundation's Refugee Action Support. It's a program that helps refugee students get the literacy support they need to meet the challenges of the classroom. We're puffed-up-chestproud to be a part of it. You can't say they weren't warned, but the lovely folk at Adelaide Writers' Week have asked us back for 2018! How great. We love this garden festival of words and the Kids' Weekend is second to none. We'll be reading our brand new book (out Feb) and doing a Captain Jimmy Cook session. Can't wait! Squishy Minnie Children's Bookshop Visit! It was neither squishy or minnie – other than that SquishyMinnie is everything I'd dreamed it would be. It's a ridiculously charming children's bookshop in Kyneton, Vic. It's so homely and delightful that you expect it to be run by a family of kindly babushka dolls and their pet penguin, Boris. It's not. It's run by the lovely Kirsten and on Wednesday they have BookClub. On this particular Wednesday, BookClub discussed Captain Jimmy Cook Discovers Third Grade! I was lucky enough to be a part of the heated debate over morse code, vomiting cats and gender stereotypes. Brilliant. I'm personally a big fan of kids' characters with flaws – which is why we create them. I've always found that kids use these wonky characters to explore their own worlds and make sense of it... and Jimmy does a very good line in wonky. Navigating the wild waters of Surveyors Creek Primary! Here he is. Jol. In a sea of grade 5s and 6s talking about the finer points of writing a book without a point. Gold Star. From here we set sail to the grade 3 and 4 to explain why Captain Jimmy Cook is obsessed with history and full of misguided ideas about exploration and constipation... then onto the calmer waters of K - 2 to wear a few silly hats and discuss the age old question... what rhymes with elephant? 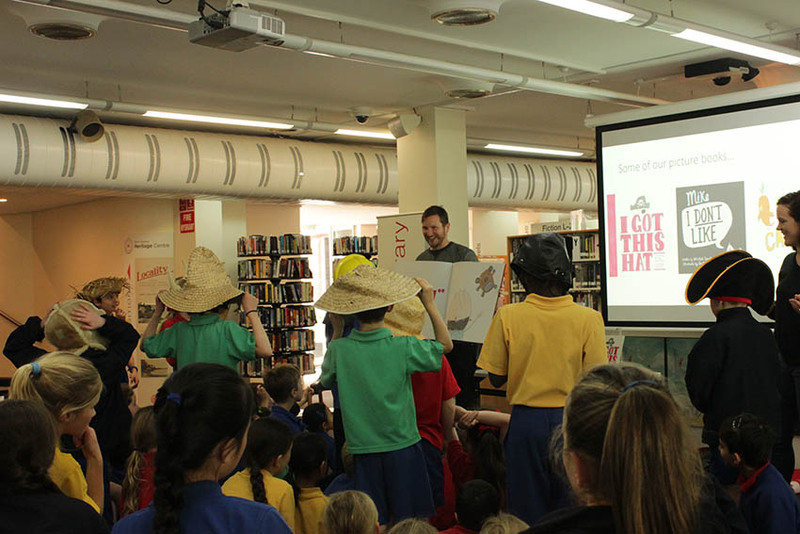 As Book Week 2017 comes to an end things were just heating up at Stanton Library. Stacks of grade 3s and 4s joined us in waking up those sleeping the afternoon away in Non-Fiction. What's Dewey Decimal for raucous loud fun in the library? 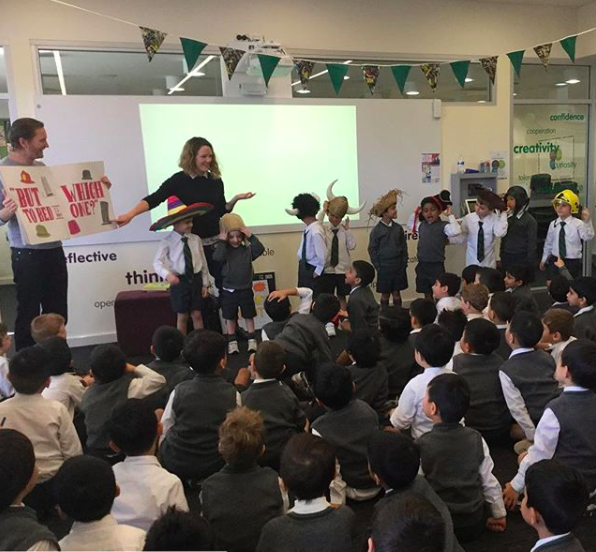 Book Week visits to the country! Today I drove out to two delightful schools in the Hawkesbury... at least I think that's where I was. First to Peat's Ridge Primary where they have a some sort of rare sparrow nesting on their grounds and then to Somersby Public for an afternoon of reading, rhyming and staring in amazement at their disco chickens.